"There shall be a City Council consisting of nine members which shall exercise the legislative powers of the city. Four of these members, to be known as councilors at-large, are to be nominated and elected by and from the voters of the City, at-large. Five of the members, to be known as ward councilors, are to be nominated and elected by and from the voters of five City wards, one ward councilor to be elected from each such ward." 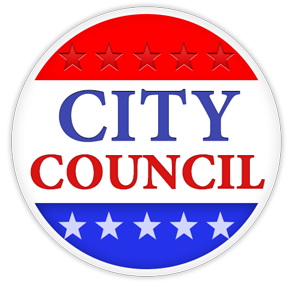 Councilors are elected to 2-year terms in municipal elections held every two years in odd-numbered years. The Council is responsible for the enactment of the City Laws which are found in the Code of Ordinances and in the Gloucester Zoning Ordinance. The Council, which meets on the second and fourth Tuesdays of each month at 7:00 pm in City Hall follows procedural rules adopted by the Council to conduct business. In connection with this legislative and zoning power, the City Council holds public hearings on proposed changes to the laws including adopting new laws and on applications for various types of Zoning Permits. See the City Clerk's Permit page for more information and applications. The Council also confirms appointments to the City Offices including department heads and members of City boards and commissions. Under the City Charter, the Council has three standing committees, each of which is comprised of three members. The Standing Committees hold regular public meetings to consider the matters referred to them by the Council. On January 24, 2017 the Gloucester City Council voted to adopt the Civility Resolution. The following are the members of the City Council. Addresses are in Gloucester, Massachusetts.